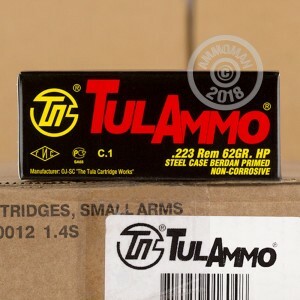 If you are looking for an all-around good hunting ammo for anything from varmints to small deer, look no further than this 223 Rem hollow point ammunition from Tula! These rounds contain a 62 grain hollow point bullet, sure to stop anything you take a good shot at dead in it's tracks. Even better, they have Tula's Berdan primed, steel cased cartridges, which are a great alternative to the more traditional, Boxer primed brass cartridges. Some people will tell you that Berdan primed steel is not a good choice: that it will corrode and does not load smoothly into your firearm. Tula has done an excellent job developing a Berdan primed steel option that is non-corrosive, fires just as well as Boxer primed brass, for a fraction on the cost! Your 40 rounds will be delivered to you as new production with fast shipping, and provide you with an all-around excellent hunting experience, while still leaving some money in your pocket. Tula Cartridge Works is a Russian manufacturer of ammunition that has been around since 1880. They market and sell their products in the United States under the TulAmmo name. 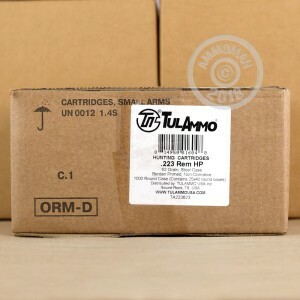 Their ammo is heavy duty and can withstand extreme climates while maintaining their outstanding ballistic properties. Go ahead and purchase your rounds and see how Tula has succeeded in making steel an excellent alternative to brass!